We’re at midcourt, and the ball is about to go up…it’s Monday Tip-Off! Start your week here at the NLSC with a feature that’s dedicated to opinions, commentary, and other fun stuff related to NBA Live, NBA 2K, and other basketball video games. This week, I’m tipping things off with a video of NLSC GrindTime taking on an Elite tier team in NBA 2K18’s 2K Pro-Am. As Arcane and I discussed in Episode #228 of the NLSC Podcast, our 2K Pro-Am squad for NBA 2K18, NLSC GrindTime, has been having some competitive games as of late. Although we had a rough start to this year’s campaign, our record has been improving, and we’ve had some enjoyable sessions in recent weeks. We’re at the point where we’re starting to get matched up with some Elite teams, which naturally puts our stick skills to the test. One of our recent matchups with an Elite tier squad turned out to be quite a game right from the opening tip. I present to you that game in its entirety, accompanied by some classic NBA Live menu music. You can also catch it here on our YouTube channel, if you can’t see the embedded video. With any luck, we’ll be able to reach the Elite rank at some point this year, and implement our full NLSC branding as we did with THRILLHO in NBA 2K17. No doubt we’ll be sharing more highlight reels from time to time, in addition to our other video content, so be sure to subscribe. 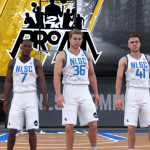 Our 2K Pro-Am sessions are a staple of the “Our Week in Basketball Gaming” segment of the NLSC Podcast, so tune in every week for recaps and commentary on our latest sessions on the virtual hardwood. Who else has been spending some time playing 2K Pro-Am or The Playground in NBA 2K18? What have your online experiences been like? Sound off in the comments section below, and as always, feel free to take the discussion to the NLSC Forum!